DJI Spark is the smallest drone in this Chinese company's catalog. With a little over a decade of experience, it has launched a drone that absolutely anyone can use. The Spark may just be the easiest drone to fly, and the most versatile the market has to offer. Its price may seem a bit high for the size, but the Spark isn’t just a toy; it can take semi-professional videos, as well. The DJI Spark is available in five colors (white, blue, green, red, and yellow) starting at $499 directly from the DJI store. The basic package comes with a battery, a pair of spare propellers and charger and costs $499. However, if you’re looking to go all in, there’s a pack where you can save a bit, which comes with the controller, an extra battery, three battery protectors and propeller guards for $689 at the time of writing this article. The DJI Spark’s body is sturdy and compact: 14.3 cm on each side, 5.5 cm tall and it weighs 300 grams. It’s light, so much so that with a bit of wind (15mph/h) it struggles to stabilize. It comes with four arms with a motor on each as any decent quadcopter should. The propellers are pretty sharp though, so it’s probably best to keep it at a distance from chlidren and pets. Obviously, you’ll also need to be careful when you take off and land from the palm of your hand. At the front, there’s a square area right above the camera. This zone hides the proximity sensors that help the device to avoid obstacles and lets you control it with your palm. On the back, there's a button, and four LED lights (which is the battery) and a flap that covers a microSD card slot and micro USB port. You can charge the battery and download photos/video to your computer through the USB port. The main camera is located on the bottom of the drone, and is mounted on an optical stabilizer on the front part. There are also 4 small rubber supports, two on the body and two on the battery. Between the front supports, there’s a second camera which always points at the ground, and it also comes with a few proximity sensors. These sensors help the drone to land on your hand, which we’ll look at a bit later. Each propeller consists of two blades that can be folded to make them easy to transport, and they need be locked on according to the arrows to fly. Under each motor, there's a light that changes depending on the mode it’s in. Normally, it’s an excellent way to check the status of the drone. The only inconvenience though is remembering what each color means when it flashes. It gets easier after you’ve used it a few times and have read the manual. A cool accessory is the propeller guards. They help to avoid breaking a propeller as well as the skin on your hands. The remote gives you even more versatility with the Spark. The video and control of the drone extend to up to 2 km, compared to the 100 meters that you’ll get with a smartphone. First, it needs to be paired with the drone. The process is a bit meticulous. You’ll have to pair the phone to the remote’s Wi-Fi network and then pair the remote to the drone. Pairing the remote to the drone is done automatically, without need for a password. An OTG cable can be used to improve the connection between the remote and your phone if you like. To do this, you’ll have to link your phone and remote through its Wi-Fi network first. If bought separately, the remote costs around $120 to $150, that’s why the pack, which also includes another battery and propeller guards, is a pretty sweet deal. 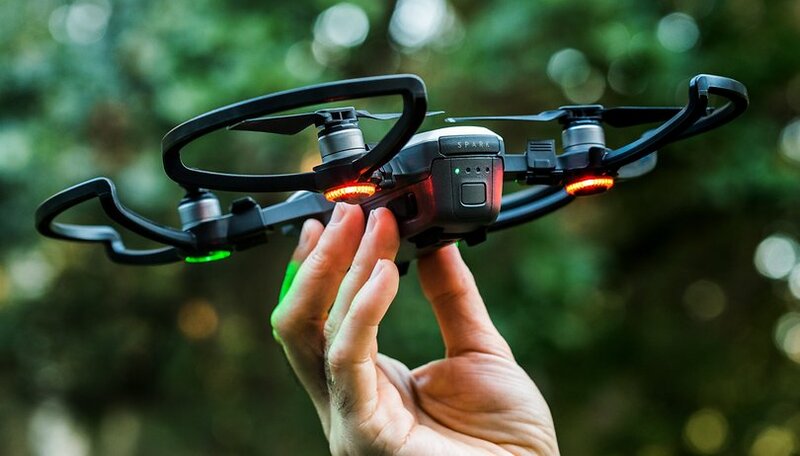 The best innovation that Spark has introduced into the drone market is its gestures control. You don’t need a phone or a remote to control it at short distances. However, it is recommended to have your phone close by and connected, just in case things start to get out of hand. The drone can take off from the palm of your hand. Press the battery button twice, open your hand, and keep it steady so the drone can start to fly. Once it’s in the air, show it the palm of your hand (the lights will switch to green). Then, just by moving your hand from side to side, you can control it. By waving your hand back and forth, then saying goodbye, it will move away from you. Raise your arms, and it will come closer. If you want it to land, get within 0.5 meters and put your hand, palm up, under the drone for it to land. It’s the closest any of us will ever get to being true Jedi. It takes a bit of getting used to for the Spark to recognize you but after a few attempts, it becomes a smoother transition. In addition to gesture control, there are some options that we've already seen on other models from the brand, like the ability to track moving objects. In tracking mode, it can follow any moving object that you mark on your phone’s display. This mode is perfect for action sports. It gives an entirely new perspective to traditional GoPro type cameras. Careful with what you mark though, if you’re controlling it with the remote, it can move very far away without you realizing it. Flying the DJI Spark is simple, but it moves quickly. It has a take-off mode which will put it hovering at about 1.2 meters off the ground, the perfect height to start manually controlling it. It will hover there until you send it an order from either your phone or remote. Sometimes, prior to taking off, you might need to calibrate the compass to improve the stability. Its ascent speed is much faster than its descent speed, for obvious safety reasons. You can control the drone much more accurately with the remote than your phone, and you can fly the Spark at higher speeds. If it happens to be a windy day, the device will counteract the gusts as much as possible to maintain a fixed position. If the GPS signal is good, it can also land where it took off, at the press of a button. Like the other models from the brand, the DJI Spark is controlled with an app that’s available for both Android and iOS. To pair your devices, the drone (or remote) creates its own Wi-Fi network with a password, which can be found on the bottom of the battery on the drone itself. You’ll need to connect to the Wi-Fi and open the app to be able to use your drone. If there are any updates available, it will be the first message that pops up. To download an update, you should connect back to your home Wi-Fi, download it, and then connect to the Spark again to update the drone. In September 2017, some security improvements were released, so you’ll have to update the Spark, or it won’t let you take off. We recommend checking to see if there are updates before you leave the house, so you can update the software before you try to fly. Once connected to the drone, all you need to do is push ‘Go and fly’ and the display will pop up with the video stream, movement control, camera options, etc. On the top of the display, there is information about the GPS signal, Wi-Fi signal and battery life. As you can see in the photo below, the battery only has 6% left, and it wouldn’t let us take off. You can set up the low-battery warning to any percentage you want. On the right, you’ll see the setting and camera controls. On the left, the automatic takeoff and landing controls and also access to follow mode and gesture control. On the screen, there will be two circles to control the drone. Navigation settings can be adjusted but initially, the right is to control side to side and back and forth movements while the left is to go up, down and turn. In the app, in addition to controlling the drone, there’s a gallery for the videos and photos taken by the Spark, an editor to quickly create videos and a social network to share material with other DJI pilots. From the app menu, you can see your flight history with loads of information under ‘Flight record,' such as accumulated flight time and distance. If you swipe up, you'll find a complete list of all the flights, and if you click on one, it will show you all the information and tracking for that flight. The camera on the DJI Spark has a 12 MP sensor and is mounted on a 2-axis gimbal system. The third axis works with the software to stabilize the image. It creates an automatic crop, reducing the area that it records, which leaves a margin for stabilization. I should mention that it hybridizes and the two axes work just fine for stabilization, especially if you consider the size of the stabilizer and price of the drone. However, the resolution of videos, which are shot in Full HD 1080p at 30 frames per second isn't particularly amazing, but it’s more than enough for hobbyists and quick shots for social media. Everything it records is available on your phone, where you can easily edit and share. Luckily, the DJI Spark doesn’t have any microphones, which means it doesn’t record any sound with the video, but considering the amount of noise it makes, you can be glad it doesn’t. Most of the settings for the camera, videos, photos, and even the gimbal parameters can be adjusted from the app. The image quality is pretty good overall. The image stabilization of videos is good and offers an incredible perspective for YouTube videos. The resolution may not be up to par if you’re creating professional videos, but for amateur material or videos to share on social networks, it’s more than enough. The dynamic range in backlit photos or landscapes isn’t great, and it leaves a lot of shadows, but in general, it’s acceptable. This type of device is mostly used for videos anyways. Each battery is 1480 mAh, which means you can fly for about 15 minutes. This is around half the time the Mavick model can be in the air. This autonomy can also vary a bit if you fly quickly, use the features a lot or if there’s some wind, which significantly reduces fly time. That's why we firmly advise having more than one battery. The DJI Spark is a useful drone, easy to transport and with enormous versatility thanks to its control. It’s a great drone to get you started in the world of piloting or for video-enthusiasts. Its main cons are price and battery life, but I truly believe the possibilities that it offers make this drone worth every penny.